This is a guest post by “Shunyata.” Shunyata has training in financial engineering, actuarial science, statistics, and mechanical engineering. While he does not work directly with structural economic theory, his background in financial engineering gives him insights. The observations below represent Shunyata’s personal opinions based on his study of economics and monetary policy to protect his personal interests. This post is not intended to represent investment advice. 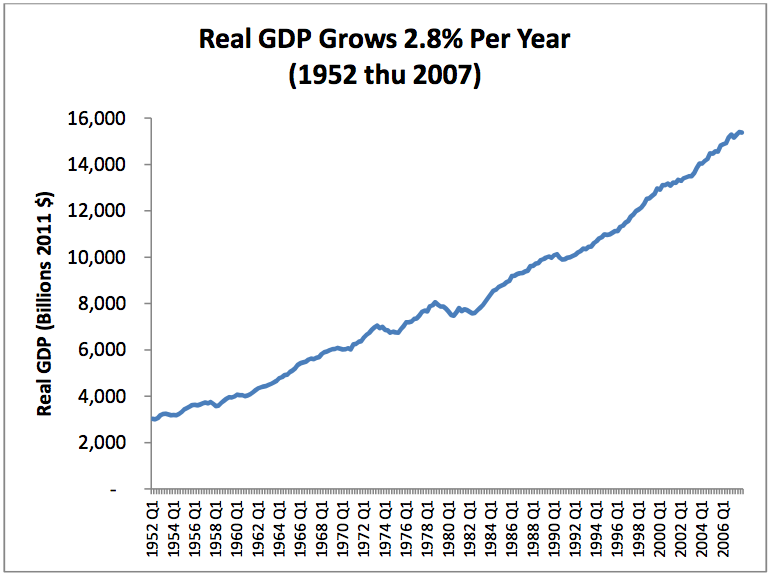 Since 1952, US Nominal GDP has grown by about 6% per year. Why did this growth occur? A. Did the economy discover new efficiencies and/or develop new natural resources? B. Did Government monetary policy artificially inflate GDP? Certainly reality is a mixture of all three mechanisms, but is one dominant? We would hope for (A). We can live with (B). But (C) would be troubling. We can evaluate the impact of monetary policy by examining Real GDP trends. Figure 1 shows Gross GDP divided by CPI to bring everything to 2011 levels. 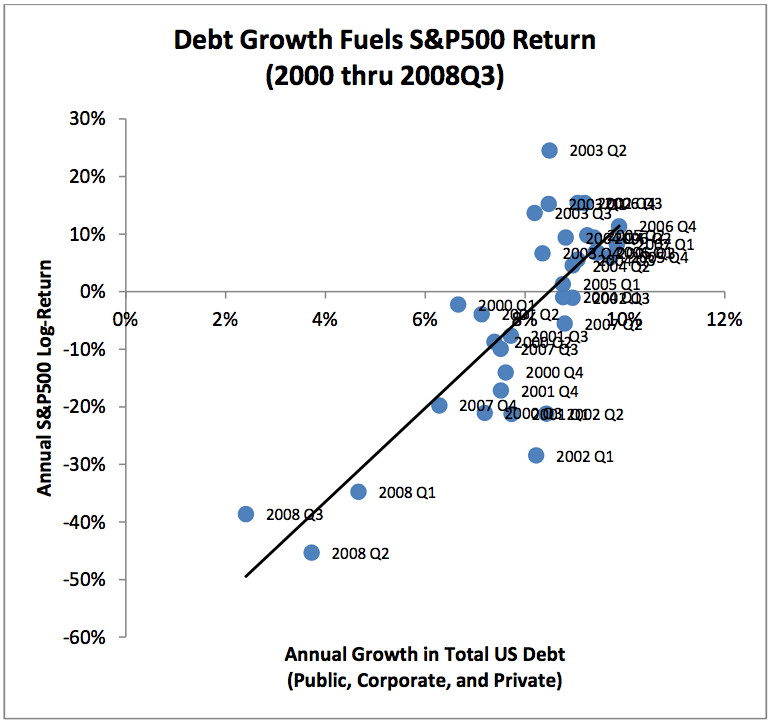 NOTE: Throughout most of this analysis, only data up to the 2008 crisis is presented. The reason for this is that since 2008 non-debt policy tools such as government guarantees, government equity positions in private companies, and Quantitative Easing are used in large scale – a very different paradigm than previous years. So data up to the 2008 crisis is used to build insight about the mechanisms affecting economic growth and evaluate our current economic policies. 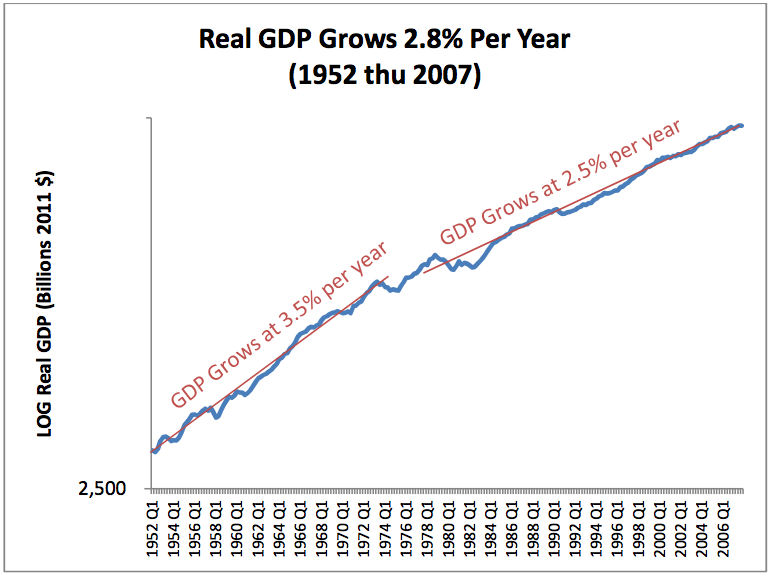 In Figure 1 we can see that Real GDP has been growing at about 2.8% per year. Although about half of GDP growth has been nothing more than inflation, there clearly has been genuine growth in the productive economy. Clearly, something fundamentally changed in the economy beginning around 1980. There are three obvious candidates for this change. During the ‘70s and early ‘80s, inflation was quite high which dampens Real GDP. Since the mid ‘80s, annual debt growth has been at about half the rate incurred during ‘70s, which dampens real economic expansion. Energy and raw material availability/price has increasingly become a constraint on real growth. We can further evaluate the impact of borrowing on GDP by examining the relationship between Debt and GDP. Here is the one-year change Nominal GDP compared to the one-year change in US Total Debt. These points represent overlapping quarterly intervals since 1952. Debt growth around 5% has no impact on GDP. This result suggests that GDP income alone is insufficient to service our societal obligations. This result suggests that we have to borrow 5% per year just to maintain our current lifestyle. This result should be troubling. 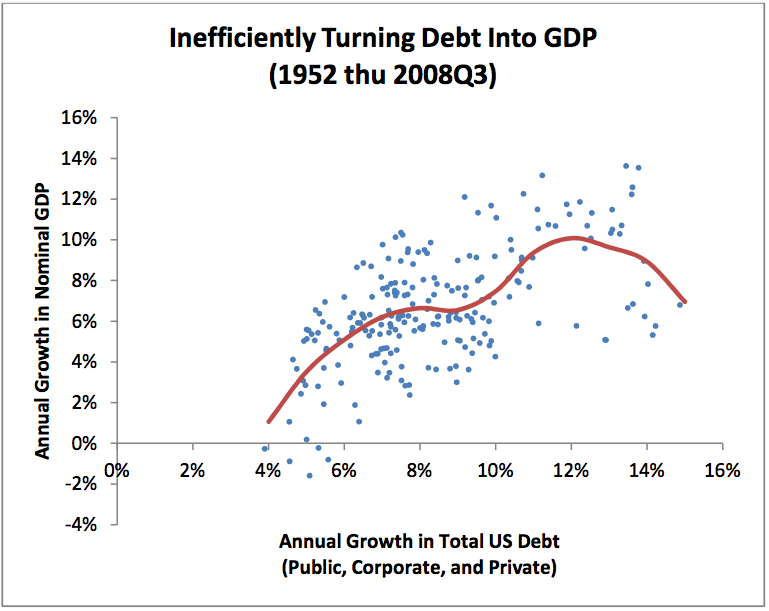 Debt growth above 10% has no incremental benefit to GDP (possibly even a negative benefit). This result should raise serious questions about current fiscal policy. 5%-10% borrowing only creates 4%-8% GDP in the short-term. The longer-term benefit may be more significant. Debt isn’t necessarily a bad thing – if it is “investment” in permanent productive capacity that will permanently raise GDP. Think about using debt to build a steel mill that supplies high quality material to the economy for decades to come. But if debt is used to purchase “ephemeral” goods like vacations or lawn service there is no return on the debt and you have created a future drag on the economy. In a non-equilibrium economy is it not easily answerable whether an economy’s borrowing is “investment” or “ephemeral” in net. When money is borrowed today to make capital investments in the economy, the returns are realized over time. In a rapidly expanding economy, GDP growth will lag debt growth but eventually GDP will catch up and grow to a permanently higher level. If debt is not used for “investment” or if growth occurs too quickly, however, debt can accrue to unsustainable levels resulting in default and lower economic activity. Since 1952, Total Public, Corporate and Private Debt has grown by about 8% per year while Nominal GDP has grown at about 6% per year. We can see this disparity in the Debt-to-GDP Ratio. Even if all of this borrowing is “investment”, it is clearly occurring at a rate faster than we are accruing the benefits of that investment. At some point, the debt service will exceed our short-term ability to pay it, even if all of the investments we made were sound in the long-run. Evidence all around us suggests that we have reached that point. Individuals are defaulting on personal debt. States and municipalities are defaulting on public debt. Nations are defaulting on sovereign debt. Financial Institutions have only escaped default by borrowing from tax-payers. Corporations have escaped default by cutting expenses and relaxing accounting standards – neither of which is a permanent solution. From this viewpoint, our economic situation cannot possibly be corrected with MORE borrowing. 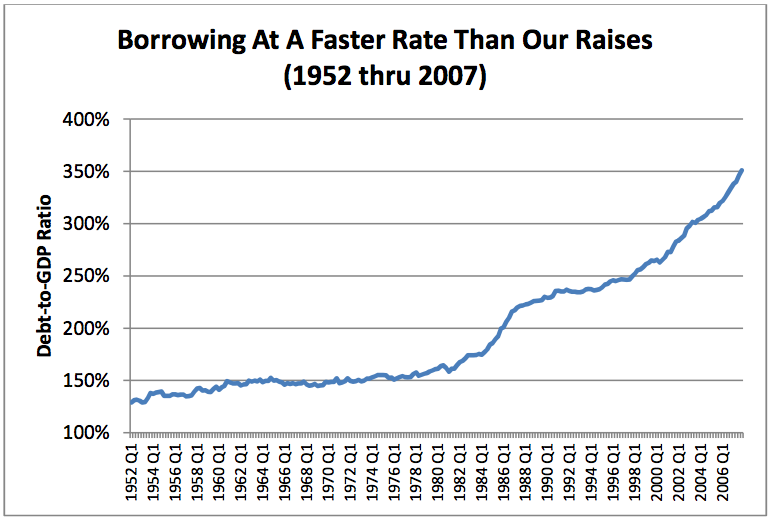 Fortunately, we are not borrowing more. Relaxed accounting rules to allow corporations to inflate the reported value of assets and reduce the reported value of liabilities. This tactic obscures the true financial health of corporations, focuses attention on current earnings rather than long-term viability, and preserves poorly managed companies in expectation of a better tomorrow. We have shifted who is responsible for paying debts from financial institutions to private individuals. As large corporations, insurance companies, investment banks and savings institutions have found themselves unable to fully back their obligations, the Government has provided bailout funds, taken equity positions and issued guarantees – ultimately making the taxpayer responsible for these obligations. But this solution is no more sustainable than the original problem, either financially or socially. What comes next will eventually be a debt contraction. Since we are fundamentally unable to even pay interest on the current debt, let alone pay it down, the contraction will eventually come through default. When this default happens, large swaths of “assets” will suddenly be worthless. This default will directly impact financial assets like pension plans, insurance contracts, and investment accounts. And this reduction in wealth will spill over into reduced demand for goods and services (including labor) throughout the entire economy. Prices for all goods and services will fall or cease to be available – this is deflation. Central Banks are trying to avert this outcome by engaging in Quantitative Easing to indirectly pump money into the economy, avoid direct defaults, and stabilize the value of financial assets. Here is the one-year change in S&P500 Log Returns compared to the one-year change in US Total Debt. These points represent overlapping quarterly intervals since 2000. Here we see what mechanism the Central Banks are trying to leverage – pumping money into the markets very effectively drives equity returns (either through inflation or by increasing GDP). More recently, this has been accomplished through Quantitative Easing rather than direct debt issuance. Some reasons for this approach are that it is quicker to flow into the economy and allows economic planners finer control over the outcome. But another consideration is likely recognition that the economy cannot easily absorb greater debt levels. One consequence of Quantitative Easing is devaluation of debt, both for the note holder and the debtor, by fueling inflation in the broad economy, especially in liquid financial instruments. (And the parallel consequence of deflation is inflated valuation of debt, both for the note holder and the debtor, an outcome economic planners are deliberately trying to avoid.) This Quantitative Easing / inflation approach can help if the Average Citizen holds financial assets and can reap the benefits of this “liquidity infusion”. But the wealth concentration in the developed world precludes this escape. The Average Citizen does not have a pension, does not have meaningful savings. Central Bank actions benefit those few who need it least and extract a terrible unemployment and inflated cost-of-living penalty on the rest. And this reduction in wealth will spill over into reduced demand for goods and services (including labor)throughout the entire economy, reduced tax base, and debt service default. Again,prices for all goods and services will fall or cease to be available – this too is deflation. So how do we summarize our current economic health? Almost half of our “growth” has been monetary inflation. Our real growth has been heavily funded by debt accumulated at an unsustainable rate. Our debt is at a level that is not serviceable. Inflation and resource availability (especially energy) further reduce the serviceable level of debt. Our debt level has not been materially reduced since the crisis began. Our policy response has been to fuel inflation. This course will ultimately adversely impact resource affordability and further reduce the serviceable level of debt. Debt level and economic activity will ultimately be reduced. Both financial and physical factors suggest that we cannot enjoy a resumption of Business As Usual. Credit availability must contract to sustainable levels and natural resource availability is unlikely to materially expand. Together these factors have a profound impact on societal features we have taken for granted. Imagine a return to cash-based transactions rather than credit. In a zero-growth economy, what happens to investment portfolios, pensions, social insurance, and public works? Without readily available credit or energy, business models such as “mobile warehousing”, disposable goods, and e- tailing may no longer be viable. Managing these transitions requires prudent rethinking of our expectations, physical lifestyles, and financial positioning. 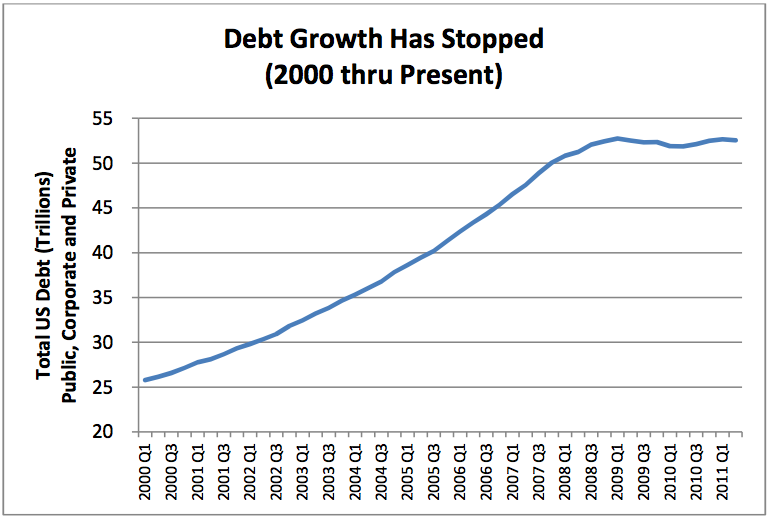 This entry was posted in Financial Implications, Guest post and tagged Debt, quantitative easing. Bookmark the permalink. In Keen’s blog he has a list of Essential Posts on the left. Reading these will give you a good summary of his position as a heterdox economist. “efficiency is another great source” and other gems, LMAO. Thanks! I am at a conference (where I am speaking) with incredibly bad internet service, so will have to wait until later to watch this. I keep explaining that these things take time, when they do work. They don’t always work. See you on ASPO TV I expect. The powers that be (TPTB) are running psychological operations against us, some of your conference attendees are obviously playing their part. This latest ‘efficiency’ eureka moment is TPTB new meme in the ongoing quest to dominate and so set the agenda. What ever happens TPTB want to be wearing the white suit and smoking the cigar metaphorically. The government is certainly doing its part to cover up our problems, and to see that articles are published showing how “wonderful” things are–more efficiency, more places to drill, natural gas forever, etc..
La Curee, I think you have made a great point, the psychological manipulation is massive, and the amount of dollars that are invested in that research just on the commercial side are amazing. I withheld much television from my children, and had them read books, and engage in conversation instead. The difference in both socialization and critical thinking skills is pretty dramatic. I come from a very conservative political and theological community but I would send my son to American University in the Summer, my community was extremely puzzled. I had no qualms about the incredibly rich liberal exposure that he got, and the conversations that it engendered – because he had the critical thinking skills to decide on his own. I’m not sure how many people are really awake out there. To be immune to the pyschological manipulation is a real advantage now.